Although Trudi is mainly known for her paintings and illustrating she originally trained in ceramics and was one of the first group of students to graduate from the degree course at the Farnham College of Art. After working in suffolk, producing slipware, she joined the staff at Winchcombe pottery where she met and married Joe. Together they worked in Africa and Australia and eventually set up their own pottery in the highlands of Scotland. With the birth of her daughter Clare there was little time for working on the wheel so Trudi concentrated on pottery decorating and developed increasingly detailed studies on paper. Her work covered many techniques but pastel and watercolour are her predominant mediums. Recently she has concentrated on dry-point etchings, which she prints on her own handmade paper. She is best known for her flower studies but is equally at ease with landscapes, birds, animals and children. Since starting to paint full time in 1980 Trudi has had many solo and group exhibitions. 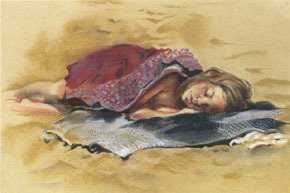 She has also produced a large range of cards and prints and was commissioned to illustrate a book by Jeanine McMullen. Trudi now works in her beautiful studio near Aberporth in West Wales surrounded by the animals, plants and objects that inspire her work.